The BC Ministry of Agriculture now oversees the issuance of Class A and Class B licenses under the Meat Inspection Regulation of the BC Food Safety Act. The federal government is washing its hands of meat inspection in three provinces, including B.C. — a move food inspectors warn puts consumers at higher risk of eating contaminated meat products. The Canadian Food Inspection Agency has been responsible for inspecting about 60 provincially registered slaughterhouses in B.C and another 40 in Manitoba and Saskatchewan. But starting in January 2014, the task will fall to the provinces, which union officials say lack the funds and the infrastructure to make sure consumers are protected from potentially deadly contaminants such as E. coli, salmonella and listeria. “Once Ottawa leaves town, these provinces will be left to pick up the pieces of the program and try to build a replacement safety inspection work force,” said Bob Kingston, president of the Agriculture Union of the Public Service Alliance of Canada, the union which represents federal food-safety inspectors. “Without the appropriate infrastructure in place, there’s no way they can meet the deadline,” he said at a press conference in Vancouver Wednesday morning. B.C. currently pays the CFIA about 40 per cent of what it costs to deliver the program, said Kingston. To build and run its own program means the province will have to shell out three times as much. 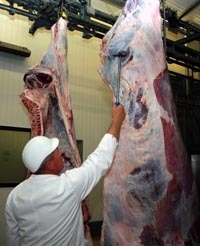 Because there is already a shortage of meat inspectors, and it takes two to three years of training to get proper credentials, it will also be “virtually impossible” for the province to recruit qualified staff before the deadline, he added. Slaughterhouses in B.C. can apply to be registered federally or provincially. Provincially registered plants can only sell their products in the province they operate, and cannot export their meat to other provinces. Only slaughterhouses that undergo federal inspection — considered by the union to be more stringent than provincial standards — can export their meat internationally. B.C. has about 60 provincially registered facilities and about 15 to 20 federally registered plants. Kingston said the proposed pullout will affect about 65 federal meat inspectors in the three provinces, but they can easily be found jobs elsewhere in the agency. “The people will be absorbed. That’s not the issue. The issue is food safety,” he said, calling on federal Agriculture Minister Gerry Ritz to reverse the decision. An online petition has also been launched urging Ottawa to reconsider its decision. The move is expected to save the CFIA about $4 million annually. Comment: Industrial animal agriculture, along with bureaucrats and politicians, put the economy and corporate profits ahead of animal welfare, public health and safety, the environment, and citizens’ rights. Exposing the truth should be easy but instead there are too many in power with vested interests who want to keep us muzzled. Thankfully, former employee, Daniel Land, was heard and now after five years there will be consequences to the company coverup. I am writing to ask you to ban the slaughter of any and all animals without stunning them first, as well as the religious sacrifice of animals.